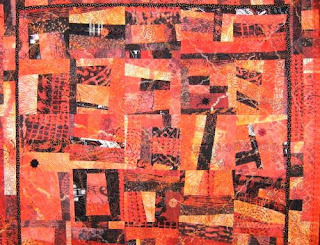 To the Mid-Atlantic Quilt Festival! 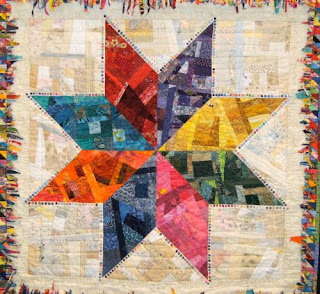 I wonder if the recent String Quilt craze will be on display at the quilt show. Hmmmm!! I guess I'll let you know when I return. Just last week, I got the privilege of shoveling snow and then pulling weeds...all in the same week! A wintery mix is in the forecast for Wednesday. Oh no!! Maybe I'll get stuck with all those wonderful venders and quilts for any extra day in Hampton Roads, VA. 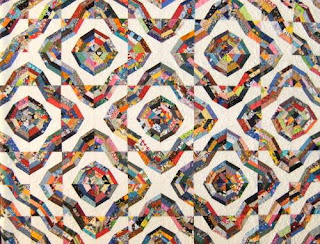 Here is what I saw that would qualify as string quilts to me at the Mid-Atlantic Quilt show. So do I wish for another day of snow so you can play? Looking forward to seeing some pictures. 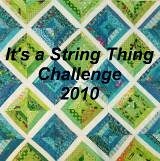 I saw a string spider web quilt at the show! Which One? I took pictures. Was it with pinks?